Bacterial associated with invertebrates were considered as a good source for biological active compound exploitation. However, this kind of research was very limited in our land. In this study, sponge-derived bacteria were isolated, extracted and tested for bacterial inhibition, the strong active strains were identified by 16SRNA analysis. The results showed that there were 8/25 bacterial strains with antibacterial activity. We reported here for the first time strain HM4 isolated from Vietnamese sponge, was most closed to the well-known actinomyces Streptomyces graminearus. This HM4 strain was strongly inhibited to Bacillus subtilis ATCC6633 and Escherichia coli O157. The strain HM2 inhibited to B. subtilis and E. coli while strain HM15 showed active against B. subtilis and Serria marcescens PDL100 causing white spot fatal disease in reef building coral Acropora palmate. They were identified as Bacillus siamensis and B. subtilis respectively. Indeed, the sponge-derived bacteria were able to inhibit both Gram-negative and Gram-positive indicator bacteria. Also, they varied in colonies characteristics, shapes, sizes, and antibiotic susceptibility types. Therefore, they were concerned as completely different potential strains. We suggested that classification research of those remain potential strains should be added for further developing of other biologically active substances. 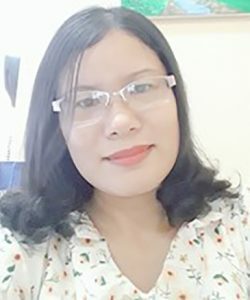 Pham Thi Mien has completed her PhD at GEOMAR Kiel Germany in Marine Microbiology Department in 2014. She is working at Institute of Oceanography in Nha Trang Viet Nam. She is interesting in marine microbials for bioactive compounds. Also try to connect microbials with other marine invertebrates for understanding of their role and function in host and those relationships.